In August 1854, the trustees officially proclaimed that “Any student graduating at this Institution having been engaged in literary pursuits for three years, and of good moral character, shall be entitled to the degree of A.M” (Beaty 181). The A.M degree, which Davidson had been awarding to distinguished alumni since 1846, was a means to “honor promising careers and did the college’s prestige no harm, either” according to Mary Beaty’s History of Davidson College. By 1859, the college had awarded no less than 33 graduates with this honor, including four who were retroactively awarded the degree in 1846. 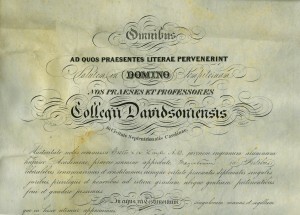 By 1879, the college had awarded 67 men the A.M., a degree which only required them to apply and pay for the diplomas. The trustees, noticing that this process did not satisfactorily vet candidates for the honorary degree, passed a resolution on June 28, 1871 that urged that the “degree of A.M. be conferred with greater caution and discrimination than has been hitherto observed.” By 1879, the faculty agreed that the A.M. should not be given an honorary degree, and rather it should be earned by “young men just out of college” (Beaty 182). Under the new plan, the A.M. degree would only be conferred to “those ‘who have pursued a prescribed course of study for a year, and have stood an approved examination” (Beaty 182). The prescribed course of study would include three course with undergraduates and an additional “special study” course. However it was not until June 1884 that the trustees formally adopted a resolution that “that the present requirement for the degree of A.M. be abolished, and that the applicant be required to stand a satisfactory examination, or to write a satisfactory thesis” before receiving their degree. In the latter half of the 1880s with the established, more rigorous course of study for the Masters degree in place, two paths to the degree emerged. For some “graduate students” the process entailed staying at college for a fifth year to take courses not taken as an undergraduate; the more popular route to degree allowed “non-residents” to live away from Davidson studying a year-long predetermined course of “special study” on a given subject matter. Beaty explains that in this latter case, “the appropriate faculty member planned and assigned the course of study on which the thesis and examination would be based. Edward Mack, for example, worked in Greek under the direction of Professor Graves and read parts of Demosthenes, three plays by Sophocles and one by Aristophanes, and several English-language commentaries on these works” (Beaty 182-183). Many other important members of Davidson College’s history also undertook the Masters degree, including three future presidents: Henry Louis Smith, Walter Lee Lingle, and William Joseph Martin. “M.A. 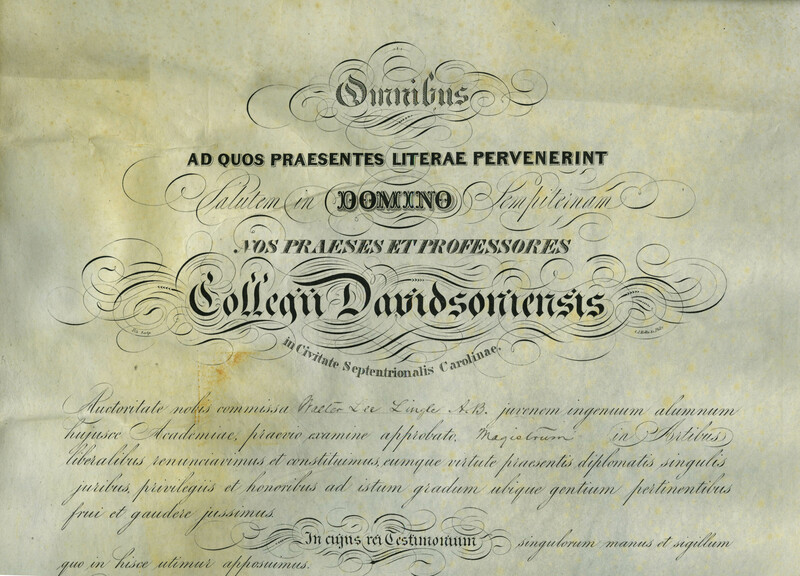 Degree Abolished from Davidson Program.” Davidsonian. 14 September 1932: 1, 5.